Naokimi Ushiroda, CARP America President, and myself recently attended a portion of the National Ocean Challenge Program (NOCP) in Kodiak, Alaska. 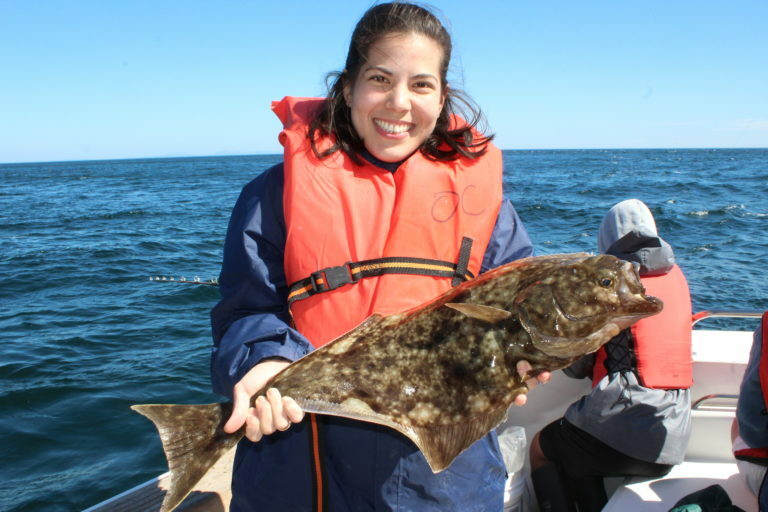 NOCP teaches young adults deeply-rooted principles through fishing and ocean education. This year, the program hosted 36 participants from America, Russia, Japan, and Korea (the biggest and most diverse group so far!) for 21 days starting July 10. Having grown up on an island, I love the ocean! By fishing, I can also connect to the heart and vision of Father Moon. Having grown up on an island (St. Lucia), the ocean holds a very special place in my heart. So, it was a great opportunity for me when CARP and Ocean Challenge decided to collaborate together to uphold Father Moon’s vision of training young people in a culture of heart. During the day, we joined the participants on the ‘Good Go’ boats. Heading out to the ocean in the cool morning breeze, we felt hopeful and excited, anticipating a good day’s catch of fish. By spending the whole day together on the boat, we got to connect and bond with our team members. There is a lot of time to get to know each other when you are placed on a small boat with 8 other people all day. Being on the Good Go boats with a small group fishing was a wonderful experience. Each time someone shouted, “Fish on!” we cheered with excitement as they eagerly reeled in their lines. It was very uplifting to see everyone encouraging each other and giving each other a pat on the back, no matter how small the fish was. We caught halibut, salmon, cod, flounder, and rockfish of all sizes. During lulls when the fish were slow to bite and people were feeling a bit down, Captain Greg Odlin would read us some of Father Moon’s words about the ocean to renew our spirits. We gained newfound encouragement from these words as we tried to imagine how Father Moon must have felt to be out on the same water. Fish On! The whole team was so excited when someone caught a fish! There were a few challenges on the water as boats would malfunction or have engine troubles. However, the captains were well-trained to fix all kinds of engine problems. True Father would be so proud; he used to say that captains should not only be able to fish effectively but also to fix any mechanical problems with the boats. We presented about CARP and our STEP UP program which conveys Unification Principles in simple, relevant, and applicable ways. One of the other great perks of this program is that you get to eat fresh fish every day! The cooks really took the time to prepare healthy and tasty meals. Imagine enjoying fresh Alaskan fish sashimi to your heart’s content! Aleksei Ponosov, the first Russian participant, shared, “I feel good to be representing Russia. I decided to come to Ocean Challenge to get a new experience and because I thought it would be a good way to make friendships and relationships with the American youth. It is an opportunity to see how we can work together in the future. ...but 2 king salmon! They brought 40 pounds of fish meat to share with CARP members at the upcoming Global Momentum conference in Las Vegas! As the participants finish their last week, we wish them a bountiful harvest. Thank you for welcoming us so warmly and for making our oceanic experience a beautiful and transformative opportunity.